We have this amazing plum tree in our yard, a Brookred we think – it is like 40 years old. Because it is so old, we have been taking better care of it the last few years. Trimming out the dead branches, using fruit tree fertilizer on it in the spring and the plums are amazing. We usually lose most of the plum buds to the spring hail storms, but this year, we had stronger plums and not as bad storms. In our backyard that is, other people in Calgary, not so lucky. In previous years the hail has shredded our BBQ cover, so the plums didn’t stand a chance. In the past I would be lucky to get a bowl of plums to eat, this year, we are on the second big bowl and still picking! I picked a bucket yesterday. When I pick plums I think of my friend Dani, a pastry chef and supermom extraordinaire. I remember the first time she came over when the plums were ripe and was eating and thinking out load about all the things you can do with the little plums. This post is for you Dani, happy birthday my friend. So what to do with little Calgary plums? Compote? Cake? Stewed plums? Off to google I go in search of a recipe that I can doctor into being on the healthful side. I love the challenge of removing sugar and white flour and turning the recipe into something better. Found it, Plum Clafoutis. Clafoutis is a traditional french dessert that was made with cherries. The batter is flan-like, using eggs, sugar, milk and flour. I found lots of versions of it using plums but they all included a lot of sugar too. Eh, I can do better. I replaced the sugar with honey, milk with almond milk, flour with spelt and sprinkled sliced almonds on top of the batter. It was delicious and I have enough plums to make a dessert every weekend in September! Preheat the oven to 375 degrees and butter the baking dish. Place the plums on the bottom of the dish. Mix the flour, cinnamon and salt together. In a separate bowl, whisk the eggs, egg yolk, vanilla, honey and almond milk together. Add the wet ingredients to the dry ingredients, whisking to blend well. 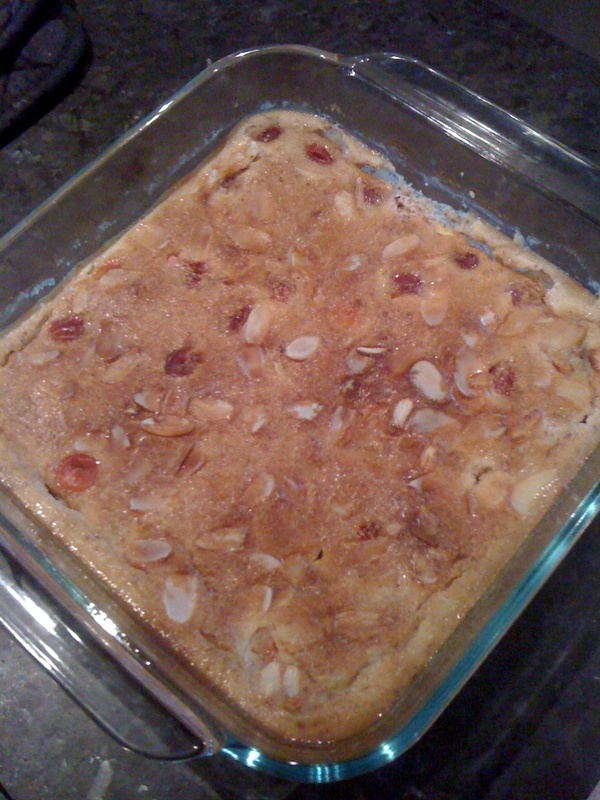 Pour the mixture gently over the plums, sprinkle the sliced almonds over the top and bake for 50-60 min until golden. Let cool, but serve warm with a dollop of yogurt and a drizzle of honey (or frozen yogurt as preferred by Tony).